Excellent article. I was curious to see how the processor performs with regards to vCenter and SSO. I currently have 3 x HP N36L Micro Servers and although they are excellent price and power wise I find the CPU struggles with some tasks. I was either thinking of purchasing a few more smaller, more powerfull server which the NUC looks ideal for or 1 big server and nest ESXi hosts. So, how do the CPU’s perform and what is the power consumption like? I haven’t actually confirmed the power consumption myself as yet (will do this weekend) but other people have done so and have seen power consumption of just 6-11 watts at idle, rising to ~35 watts under high load. According to cpubenchmark.net, the CPU in the NUC is almost twice as powerful as that in the N54L (the latest in the MicroServer range), and about 3 times as good as the N36L. I don’t foresee nesting as being an issue, and that is precisely how I plan to use my lab. I will be testing nesting of AutoLab on my platform this week. Thanks for the article. This helped tremendously when trying to get this to work for a business application we were using. Fantastic write-up! brilliant series of articles. When my NUC arrived I had ESXi and my first vm running in under 1h, based on your clear instructions. Thank you! Just here to confirm that my NUC DC3217IYE is running happily with a Kingston HyperX 16 GB DDR3-1600 Kit (KHX16S9P1K2/16, Genesis PnP). I also encountered the F2-BIOS/HDMI problem, which I was able to solve with a HDMI-to-DVI adapter which I had lying around and connecting the NUC to a regular computer monitor. No problems after that. I saw somewhere that the i5 version will come out in April, can’t wait! I CAN’T thank you enough. this was so timely as my old servers started to act up and frankly i think i am tired of great. but USED hardware. Anyway, i wanted to let you know that with ESXi v5.1 you can’t use the TGZ provided above, but a VIB instead. I used it with ESXi Customizer and worked like a charm. Thank you so much for the tips. This is an amazing article. I needed a little piece of advice. What tool do you suggest so that I can only install from USB and use an installed SSD in the msata slot. I am trying to use linuxlive and unetbootin but I get an error on both when trying to use the ISO after the customizer kicks it out. Let me know what you think. Is VMDirectPath I/O a lost cause? Have you read anything about the newer models? Something I was thinking of doing is to hook it up to an external drive case and run a VM with nexenta and give the USB3 buss to this VM. This way I could have a nice ZFS san. Hi Fredrik, sorry for the slow response, not sure how I missed this one. SOme of the new models do include DirectPath IO. Thanks again for this guide! I just got the DC53427HYE, created a custom ISO with 5.1 U1 + 82579M Intel NIC driver. After installing onto USB (love the Pny!) onto the NUC, ESXi pops up an ‘vmfs3 failed’ message, as well as the ‘no compatible adapter found’ message. Any updates on adding/testing additional network adapters? Would like to add another nic. Just a quick update to this. I have ordered a couple of gigabit Mini PCI Express NICs today so will be posting the results of my testing soon! Just checking to see if you had any success with the minipcie gig cards you obtained for this project. 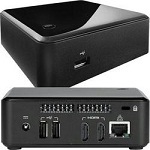 I just purchased one of the newer haswell nucs to upgrade my htpc, and have an older celeron based first gen nuc I was going to turn into a mini vsphere host based off of your excellent guide, was hoping to hear you had some success, and if so, which models. Thanks! I don’t understand where you get the ISO from. Where in workstation 10 do you create an ESXi ISO? I’m assuming that as you state the requirements being vmware workstation 8 or newer. No mention of a ESXi ISO and where to get it. DUDE THIS IS FRICKEN AWESOME! If only I can get my thunderbolt ethernet working then I would be set. Has anyone solved this? I couldn’t get “Part Two – Install bootable ESXi to the USB stick” to work. The NUC would not get assigned an IP address. Probably I configured the VM wrong. I went out and bought a USB CD-drive (Samsung SE-208) for 25 euros. Burned the same ISO and installed on the NUC without any problems. Nice one. For the IP did you plug in a monitor and configure manually at the DCUI?